Well, one can never be too careful, but to the eyes of a local the simple fact of travelling without your own car is crazy, if not impossible to imagine. So I took her advice, and the food, and left. 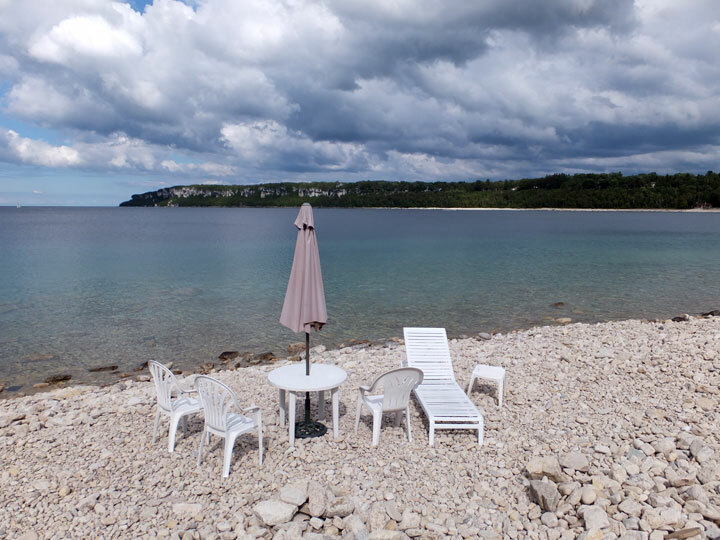 The Bruce peninsula is a long stretch of land of 100km into the Hudson lake, about 200km north-west of Toronto, in the province of Ontario, Canada. 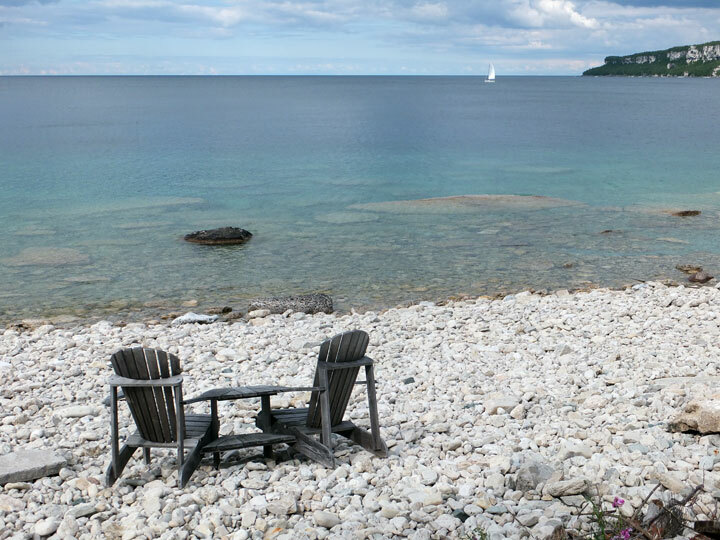 To get there from Toronto, take a Greyhound bus to Owen Sound (running everyday: C$40, 4 hours). 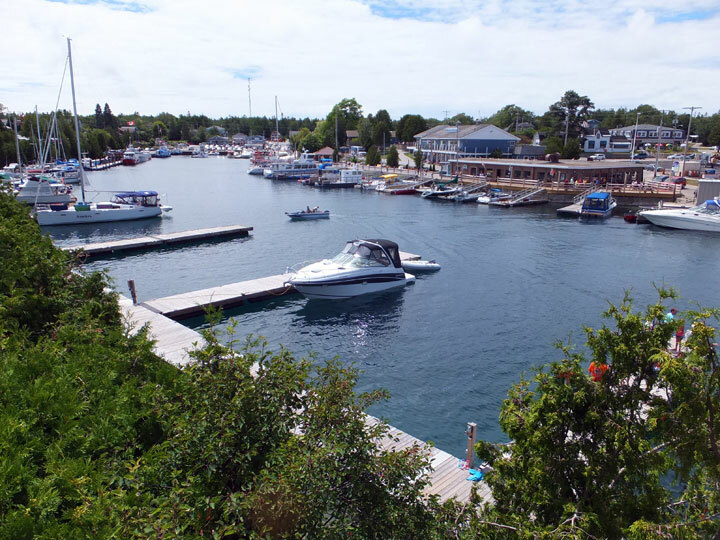 From there, you can start hiking on the Bruce trail, or there’s a First Student bus on weekends and holidays to Tobermory, and you can request any stop you like along the highway 6 (from Owen Sound down to Tobermory: C$32 and 1,5 hours). 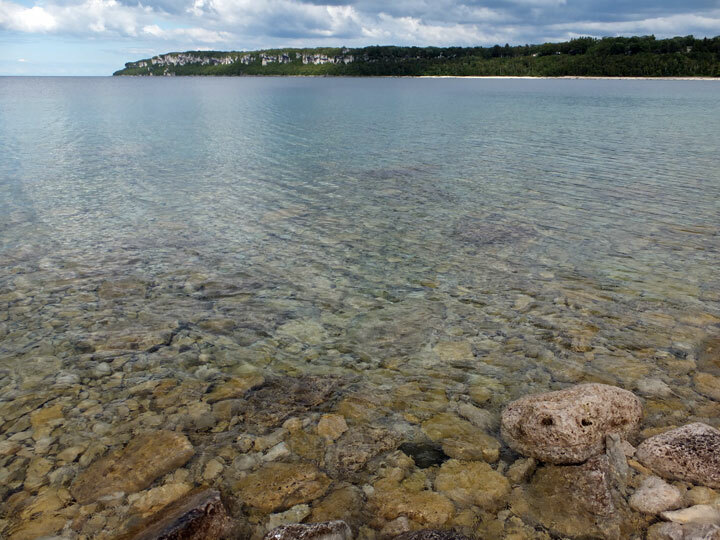 The Bruce trail runs for 900km from Niagara to Tobermory, at the tip of the peninsula, where a ferry service crosses to Manitoulin island – claimed to be “the biggest fresh water lake island in the world” (4 departures a day). 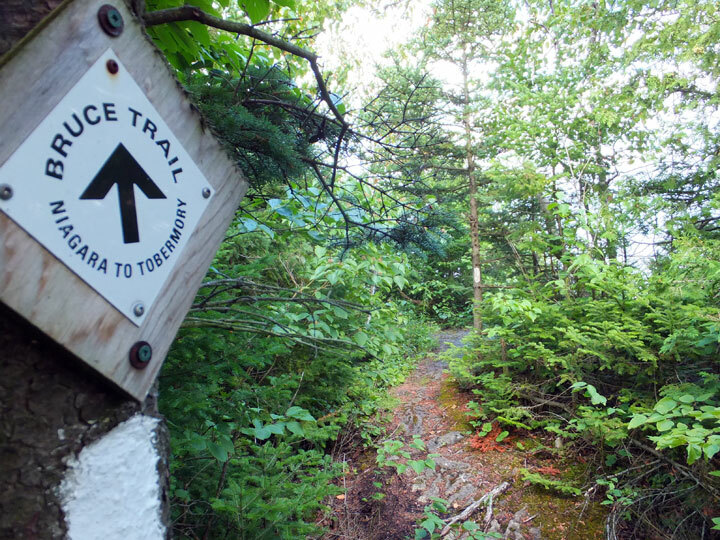 The trail has over 300km of side trails allowing you deeper sightseeing in the form of loops or shortcuts along the main trail. I got off the bus at the Visitor Centre in Ferndale, halfway down the peninsula, where I found all the necessary maps and information on where I could buy food and camp out. Once I’d got food from Rachel’s bakery (with free wifi) and drinks from the local convenience store I walked to the beach to find the trail. I was immediately stricken by the white sandy beach and Caribbean-like pristine-clear water. The small marina and the cliffs in the background made the scene no less charming. But it was getting late and the weather was changing. I knew it would rain later and had to get going. I left the little town heading north-west. Passed the marina the sand was replaced by pebbles and rocks but the water remained amazingly transparent. After a few houses, the road gave way to a proper trail on the forested shoreline. But not for long. To my surprise, the trail became a dirt road with more houses. Whether the houses were on the lake side or the land side of the road, the facing shore would be private. People were saluting as I was walking pass their houses, if not willing to make a bit of conversation. Again, they all seemed a little scared to see me get on the trail on my own, late, and with the rain approaching. One very nice lady even offered me to camp in her garden, and have a hot shower… That’s Canada: people are very nice and chatty, and some are generous and hospitable. The lady then continued: “my girlfriend jogged along the trail last week, she said the trail can be bitchy, so watch your step! 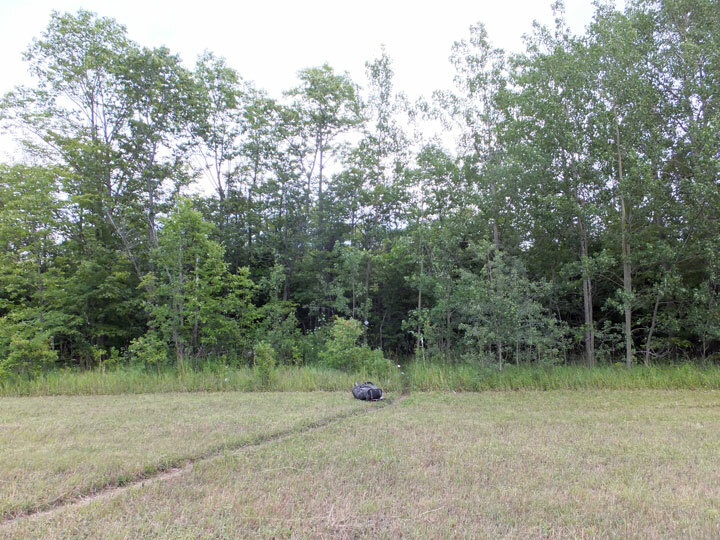 Also you’ll never make it to the next campground tonight, but you can pitch your tent by the old cabin passed the orchard.” That got me really excited! The first drops of rain started to fall when the I reached the end of the road. Although the trail is rather generally well marked I couldn’t find it there. I might have missed a sign while admiring the view. I had to ask my way to an old man passing by in his golf cart. He showed me straight to the orchard and the old cabin. 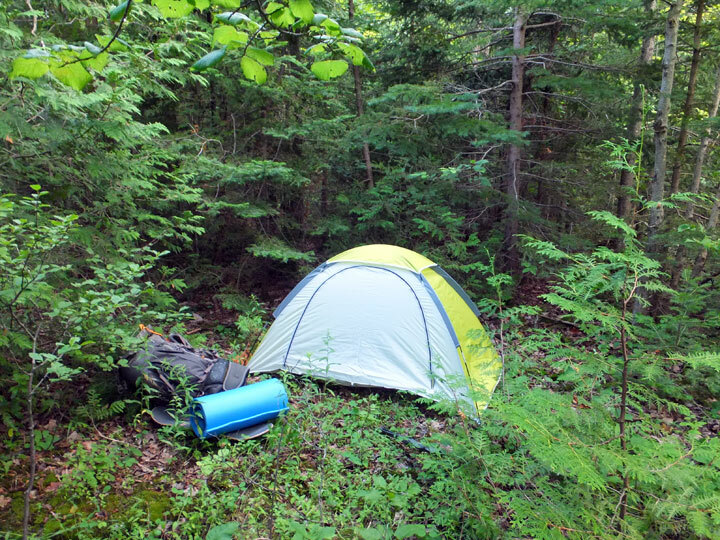 I set camp in the woods nearby, and walked further down the trail without my heavy bag. It was indeed a bit rugged and steep, but I got my reward once on the cliff: what a view! The combination of the early dusk and the low, heavy and threatening clouds were offering the most dramatic scenery. The clear view on the bay and the cliff of Lion’s Head opposite, the gentle waves of blue water breaking on the rocks down below… that was breathtaking. Back to my camp later, the night was pretty quiet, with absolutely no sign of the “grizzly” bear. It rained all night though and hopefully my new super cheap and super light one-person tent made in Bangladesh passed the test! 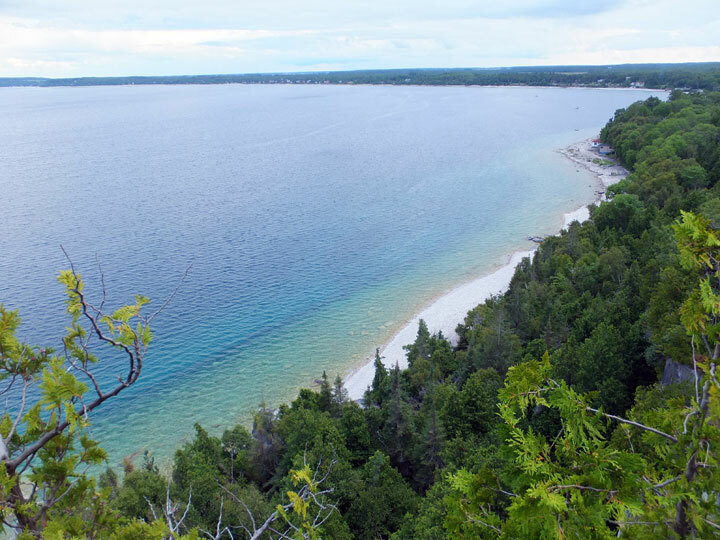 On the following day, I had to make my way to Tobermory by the road, and regretted not to have packed enough food and water to hike all the way to there on the trail. What I’ve seen was a very tempting preview of all the countless wonders the peninsula will unveil to those who have the courage and time to explore it. 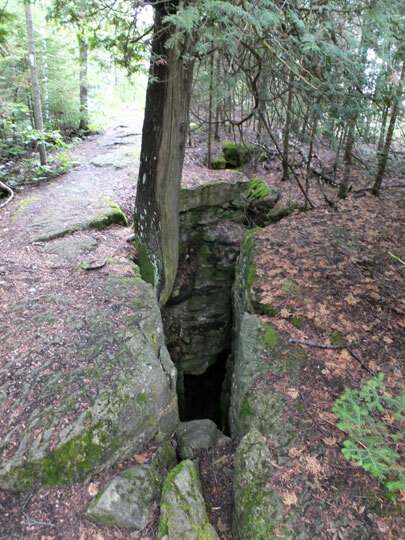 In most parts you can hike the trail for several days without seeing houses. 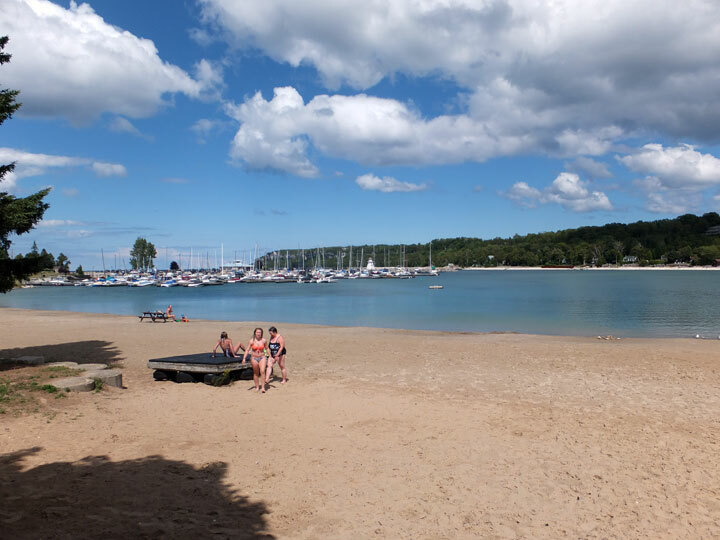 There are a variety of provincial parks and nature reserves along the way that offer a protected environment, and facilities such as official campgrounds with fireplaces and basic toilets. Just make sure you have enough food and water because it might be days before you see a shop. 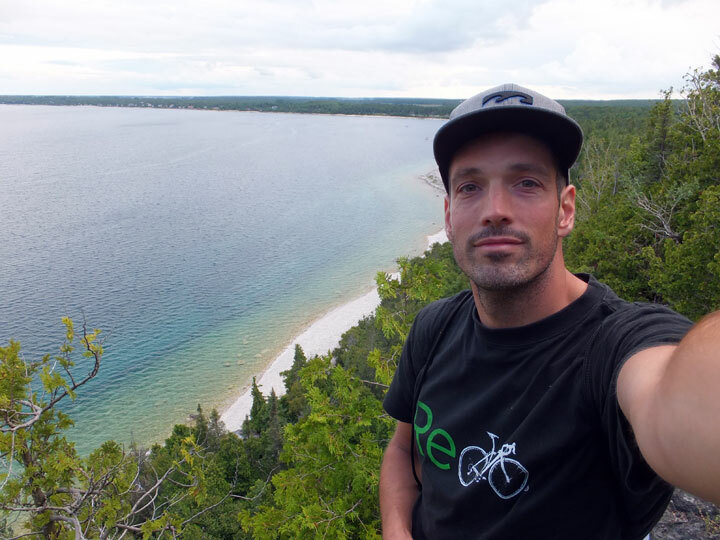 The Bruce peninsula visitor centre in Ferndale has all the information you need, and you should also follow there strict guidelines regarding safety (wild animals if not a grizzly bear!) and environment protection. Woooow c’est beau! J’ai envie d’aller voir le grizzli ! !